There is an extensive literature on the Cuban sugar industry in the island and abroad. The reason is obvious: sugarcane has been, and continues to be, the dominant crop in Cuba’s economy, and sugar the main source of foreign exchange. Data published by the Cuban government portray the sugar industry as the source of employment for almost 400,000 persons who, with their families, make up perhaps one sixth of the Cuban population. It also accounts for about one-third of the total means of production used in Cuban industry. Sugar represents 80% of the value of Cuban exports and the industry as a whole contributes 10% to Cuba’s Global Social Product (Feuer, 1987, p. 69, from Comité Estatal de Estadísticas). The production sector has been expanding in the last three decades. In the early 1960s, area harvested fluctuated around one million hectares and maximum total production reached 50 million metric tons of sugarcane. Today, production of sugarcane takes place on approximately 1.35 million hectares yielding about 53 metric tons of cane for a total production of over 70 million metric tons. Although state farms account for about 83% of the area harvested, their yields are slightly lower than those of private farms. The trend toward mechanization started in the 1960s has continued. Almost all loading has been done with machines since 1970 and mechanical harvesting increased from 25% in 1975 to 45% in 1980 and to 67% in the 1988-89 season. The processing sector of the sugar industry, despite an stable number of industrial facilities, has also experienced dramatic changes during the last 30 years. When the revolution took power on January 1959, the sugar industry consisted of 161 raw sugar factories, 16 refineries, over 20 distilleries producing alcohol and some press board and paper factories using bagasse as raw material (David, 1983, p. 100). The entire sugar industry was expropriated in 1959-60. Today, all sugar mills and sugar refineries are owned by the State and managed by the Ministry of the Sugar Industry (MINAZ). There are 156 raw sugar mills throughout the 14 provinces and 16 refineries in nine provinces. Cane milled per day has increased from around 489,000 metric tons in the 1960s (somewhat below the figures in the 1950s), to 529,000 metric tons in the 1970s, and to around 619,000 metric tons in the 1980s. The effective milling season, however, has lengthened by more than three weeks. Statistics on raw sugar production, industrial yield (recovery rate), and polarization illustrate the industry’s performance in the last four decades (Table 1). The average data per decade show a slight decline in total sugar production from the 1950s to the 1960s and an increase thereafter. The average recovery rate has decreased since the 1950s. Polarization, however, has been increasing in the last three decades.Source: Calculated from Comité Estatal de Estadísticas (various issues). Despite heavy capital investments made to renovate and modernize some industrial facilities, “the industry is still characterized by a significant number of small, inefficient operations. About two-thirds of the mills have a daily grinding capacity of 4,000 tons or less and over 85 percent were built prior to 1913” (Buzzanell and Alonso, 1989, p. 22). Sugar marketing is also under the control of the State. The domestic rationed quotas are distributed through the Ministry of Internal Trade (MINCIN), while CUBAZUCAR is the agency in charge of negotiating and marketing foreign sales. Prior to the revolution of 1959, the United States and Cuba had been major trading partners and sugar was Cuba’s most important export to the United States. Until 1960, Cuba provided over one-third of the total U.S. sugar requirements, playing the role of an “ever-normal granary” for U.S. sugar needs. One aspect of the preferential treatment it received in return is contained in the Sugar Act of 1948, which allocated to Cuba an import quota equivalent to 98.64% of the difference between U.S. consumption requirements and the sum of the fixed tonnage quotas for the domestic areas and the Philippines, with the remaining 1.36% going to other foreign countries. This arrangement allocated substantially all of the increases in U.S. consumption requirements to Cuba. The 1951 amendment to the Sugar Act set Cuba’s share at 96%. The 1956 amendment enabled domestic producers to participate in the growth of the U.S. market; i.e., any growth in U.S. consumption beyond 8.35 million short tons was shared 55% by domestic areas and 45% by foreign areas. The July 1960 amendment provided for presidential actions under which sugar import quotas from Cuba were suspended. Explicit in the legislation was the intention of restoring Cuba’s quota at the time of its return to the free world. The Cuban sugar quota was allocated to domestic areas and foreign countries (Bates, 1968, p. 522). 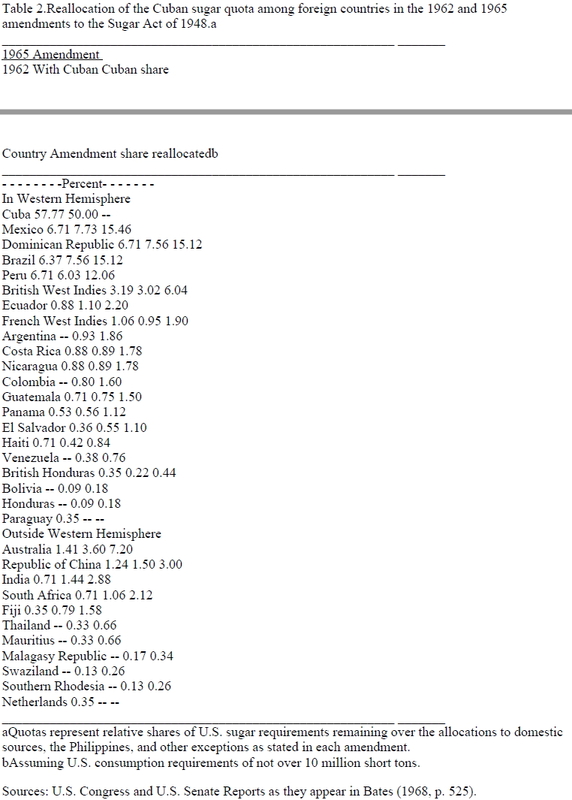 The 1962 and 1965 amendments to the Sugar Act reallocated the Cuban sugar quota (Table 2). The 1965 amendment distributed the 50 percent Cuban share of the U.S. sugar requirements (remaining over the allocations to domestic sources, the Philippines, and other exceptions) on a pro-rata basis to other quotaholding countries. Not included in that quota, however, was Cuba’s share arising from consumption requirements in excess of 10 million short tons, which would be prorated among members of the Organization of American States (Bates, 1968, p. 524). Cuban exports of sugar to the United States amounted to 2.94 million tons in 1959. Until July 1960, when the Cuban quota was suspended, Cuba had exported 1.95 million tons of sugar to the United States. In July 1960, the Soviet Union rapidly announced its readiness to purchase the former U.S. Cuban sugar quota. Cuba, who had sold over 50% of its sugar exports to United States for many years, redirected its sugar exports to the Soviet Union, China, and Eastern European countries (Table 3). In 1959, only 5.5% of the 4.95 million tons exported went to the U.S.S.R., while the remaining 94.5% was exported to other countries, including the United States. Those figures changed dramatically in 1960 when Cuba sent 28.1% of its sugar exports to the U.S.S.R., 8.5% to China, 4.1% to Eastern Europe, and 59.3% to other countries. By 1965, the U.S.S.R. was purchasing 46.2% of Cuban sugar exports while other countries (not including China and Eastern Europe, with 7.5% and 12.7%, respectively) imported only 33.6% of the total. That allocation, with some minor shifts, remained essentially unchanged until the late 1980s. The collapse of socialism in the countries of Eastern Europe, and the economic and social reforms that led to the demise of the Soviet Union at the end of 1991, initiated a new phase in the direction of Cuban sugar exports. Forecasting the future direction of Cuban sugar exports is not an easy task. Politics played the major role in the redirection of Cuban sugar trade that took place in the early 1960s (Alvarez, 1978), and continued to do so afterwards. However, it is possible to describe potential scenarios for the 1990s by looking at the current status of the Cuban sugar industry, the new trend of Cuban sugar exports developing since the late 1980s, and the legal and political environment of U.S.-Cuba future relations. Before analyzing Cuba’s sugar producing and exporting capabilities in the 1990s, one has to go beyond the summary provided at the beginning of this paper. Indicators of the industry from the last four decades provide the basis for a more thorough description (Table 4). During the 1950s, Cuba milled an average of 43.9 million metric tons of sugarcane (not all the production was milled) at a rate of 507,000 metric tons per day to produce 5.63 million metric tons of sugar with a recovery rate of 12.85% and 97.2º polarization in 86.8 days. The precise role of sugar in the pre-revolutionary economy, according to Thomas (1971, p. 1152) is elusive. The sugar sector accounted for 28-29% of the national income figures during the period 1949-58, declining to about 25% in 1957-58 (Pérez-López, 1989, p. 1631). The national income figures, however, do not show the extent to which the whole economy depended on exports; and exports did depend on sugar. In the 40 years before Batista’s overthrow in January 1959, sugar accounted for 82% of Cuban exports (Thomas, 1971, p. 1152). That figure did not change during the 1959-88 period (Pérez-López, 1989; 1991a, p. 32). At the outset of the 1959 revolution, the Cuban leadership blamed the sugar industry as the major determinant of underdevelopment in the island. As the result of this campaign, the adequate care of sugarcane fields was abandoned and some fields were turned over to other agricultural production. The data in Table 4 reflect the consequences of that policy. In the 1960s, excluding the 1969-70 season, the average of all indicators dropped: sugarcane production fell to 42.31 million metric tons, cane milled per day decreased to 483,000 million metric tons, and sugar production averaged 5.19 million metric tons. The 1969-70 sugar season was a turning point in Cuban sugar policy. After 10 years of neglect, Castro himself declared that sugar was the backbone of the economy and challenged his people to produce 10 million tons of sugar. Although a record crop of 8.54 million metric tons was produced, the harvest lasted 217 days (143 days of actual grinding), robbed sugarcane from upcoming crops, and inflicted staggering costs to the rest of the economy. Data from the 1970s and 1980s reflect the increased attention given to the sugar industry after the failure of the 1970 campaign. Average sugarcane production increased to 55.27 and 70.24 million metric tons in the 1970s and 1980s, respectively; milling rates increased to 530,000 in the 1970s and to 639,000 metric tons per day in the 1980s; and sugar production increased to 6.24 and 7.65 million metric tons in the 1970s and 1980s, respectively. Different trends are observed for recovery rate (decreasing) and polarization (increasing) in both decades. The average length of the season has also increased in both decades, to 103.7 days in the 1970s and to 110.2 days in the 1980s. It is surprising that this has not already been reflected in production but assuredly as conditions deteriorate further as they must unless from some unlikely source there is a substantial injection of hard currency, it will become increasingly difficult for Cuba to maintain the current or recent level of output (Licht, July 1991, p. 342). Conditions did, in fact, deteriorate during the 1991-92 sugar campaign. Castro himself stated that, because of fertilizer shortages from the U.S.S.R., a large amount of the sugarcane for the 1991-92 season did not receive any fertilizer (El Nuevo Herald, Nov. 26, 1991, p. 3A). The 1991-92 harvest, normally underway by mid-November, did not start until mid-January amidst speculations about how much the current crop could drop below the 1990-91 output of 7.6 million metric tons. 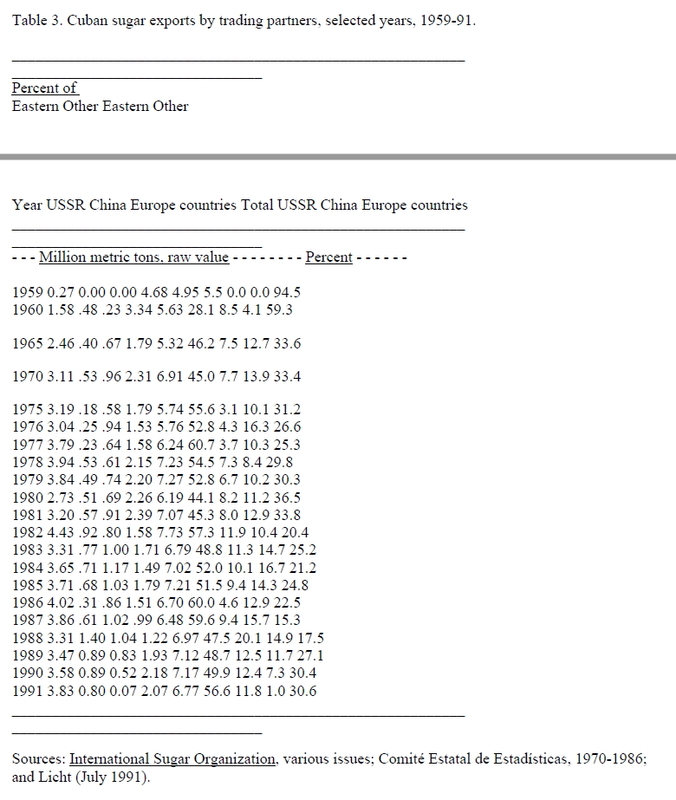 No other official news concerning the 1991-92 crop was available until January 26, 1992. In an interview in the weekly Juventud Rebelde, Politburo member Carlos Lage acknowledged that it would be impossible to “even get close” to the 7.5 million metric tons they had hoped for. He also stated that, in addition to the late start and lack of adequate fertilization, the “material difficulties” from which the current crop would continue to suffer included: (a) poor maintenance and repairs of machinery during the off-season due to shortages of spare parts; (b) breakdown in the sugar transportation system; and (c) lack of fuel for field and mill operations. Sugar traders and statisticians began lowering their projections about the volume of the 1991-92 Cuban crop. Despite the total blackout on news from the island, there seemed to be a consensus that even a 6.5 million metric tons might turn out to be substantially high and 5.0 million, although rather improbable, could no longer be dismissed out of hand (Sociedad Económica, 1992a, p. 1; Hagelberg, 1992; Rivero, 1992). The progressive downward adjustments continued in early April when the United States Department of Agriculture lowered its December forecast of 7.3 million metric tons to 6.0 million in its March release. Also in April, two new pieces of information came out of Cuba. The first was given by Castro in his speech to the VI Congress of the League of Communist Youth on April 4. Breaking an unusual tenweeks silence, Castro used the term “tense” to describe the current harvest, reiterated its delay, and blamed it on lack of fuel, fertilizer and spare parts. The second was contained in an interview to Juan Varela Pérez, Granma‘s sugar correspondent, in Radio Progreso on April 14. He stated that the tense harvest was already suffering from unusual early heavy rains and that most of the standing canes were located in the key provinces of Ciego de Avila, Camagüey and Las Tunas, which had always performed well in previous seasons. These provinces, according to official 1988-89 figures, by volume of cane, were respectively the first, third and fifth largest producers of the 14-cane producing provinces in the country, accounting for 33% of total cane volume. The official recognition that the harvest was not in full swing at the beginning of the month in which it was supposed to end revealed a state of affairs worse than anticipated. It appeared that a further downward adjustment in Cuba’s total sugar output was in order. La Sociedad Económica (1992b) did that for the following reasons: (a) the time lost was longer than just the eight weeks from mid-November to mid-January reported before; (b) extending the harvest into the rainy months of May through July would exacerbate transportation difficulties; milling operations would consequently be affected by the sporadic flow of cane, and sugar yields would be reduced due to the deterioration of harvested, pre-milled cane; and (c) an extended harvest into the rainy season is also very energy expensive. Although meeting this cost was possible in the recent past, present fuel shortages would work against the feasibility of an extended harvest in the current season. La Sociedad Económica estimates a final 1991/92 sugar crop of between 5 mmt and 5.55 mmt. By comparison, reported total output from 1989/90 and 1990/91 were 8.1 and 7.6 mmt, respectively. However, some members of La Sociedad Económica “Sugar Section” believe that even a final 1991/92 crop of 5 mmt is optimistic, and the possibility that Cuba will over-report its final crop cannot be ruled out (1992b, p. 2). More information became available in early May. The first was made public at the end of an international conference of sugar specialists, to celebrate CUBAZUCAR’s 30th anniversary and a meeting of GEPLACEA, held in Havana on May 5-7. When Juan Herrera Machado, Cuban Minister of the Sugar Industry, was asked at a press conference about the final output of the present Cuban sugar crop, he responded “we don’t even know that yet”. When pressed further he stated that, by placing it at between 5.5 and 7 million tons, he “wouldn’t be in contradiction with any of the great estimators, those who compute, those who forecast” (El Nuevo Herald, May 9, 1992, p. 3A). The second news was provided by Sergei Barykin, president of PRODINTORG, when he announced in Havana that, as of June 1st., Russia would not need any more Cuban sugar for the remainder of 1992, and, consequently, would not ship any more oil to the island (El Nuevo Herald, May 8, 1992, pp. 1A, 4A). In addition to disruptions in the marketing of the current crop, that decision has important implications for the feasibility of this extended harvest. More drastic cuts in oil supplies will force the Cuban government to either use oil assigned to other purposes or minimize its efforts on sugarcane harvesting and processing during the final months of the 1991-92 sugar campaign. The earthquakes felt in the eastern provinces during the month of June added more problems to the final phase of an already tense harvest. Although the official news contained no details of the damages to the sugar industry, it is not hard to believe that the industry suffered further disruptions on harvesting, loading, hauling and even milling operations as the result of damages to cane fields, roads, railroads, and mill equipment. To complicate things further, heavy rains fell throughout the island during June 23-27. The harvest was temporarily suspended in the few eastern provinces that had not finished it. Politburo member Pedro Ross Leal used Radio Rebelde to request a final effort from Cubans working on the sugar campaign (Alfonso, 1992). In mid-July, with some operations still underway, long and severe electricity blackouts were felt throughout the island. Again, no official news on damages or disruptions to the sugar campaign were made available although the breaking of a major power line that furnishes electricity to the central and eastern provinces must have disrupted milling operations. On July 19, S. Diatchkov, associate director of the Latin American Division of the Russian Committee on Foreign Economic Relations, stated in Moscow that the last shipments of Russian oil and Cuban sugar for 1992 had reached their destinations. He went on to say that Russia does not have enough oil to export and is buying some sugar from Western Europe (Gluck, 1992). When all the above factors are combined, the lowest end of the production range provided by Minister Herrera (5.5 million metric tons) has to become the highest end when forecasting Cuba’s potential sugar production for the near future for two reasons. First, there seems to be no solution in sight for Cuba’s current shortages of fuel, fertilizer, other inputs and spare parts. Second, the devastating effects of the 1991-92 season will impact on the performance of both fields and factories in future crops. For the reasons explained in a previous section of this paper, Cuban sugar exports began to experience a new reallocation in the early 1990s (Table 5). Since the early 1960s, the U.S.S.R. was the largest importer of Cuban sugar. In the 1980s, Cuban deliveries averaged below the four million tons specified in Cuba’s contract with the former Soviet Union. The drastic changes in trade relations between Cuba and Russia during 1992 indicate that the 56.7% of Cuban sugar exports purchased by the former Soviet Union in 1991 has become history. Eastern Europe is a lost outlet for Cuban sugar. For political (more than economic) reasons, these countries imported substantial amounts of Cuban sugar for the past 30 years. The amounts represented more than one million tons, or between 14.7 and 16.7% of total Cuban sugar exports until 1989. The figures fell to over 615,000 tons in 1990 and to 68,000 tons in 1991 when they represented only 1% of total Cuban sugar exports (Table 5). Asia and Oceania, which include several socialist countries, have been purchasing over one million metric tons of Cuban sugar for the past several years. The countries in these areas accounted for 19% of Cuban sugar exports in 1991 (Table 5). The Middle East and Africa show slight increases in Cuban sugar imports for 1990 and 1991 when compared with the 1980s. These purchases now represent 11% of total Cuban sugar exports (Table 5). Countries in the Western Hemisphere have also increased their purchases of Cuban sugar in the first two years of the 1990s. The main buyers include Canada, Venezuela and Mexico. Western Europe is not an important client of Cuban sugar. The 213,000 tons imported in 1991 have been the highest amount in many years but represented only 3% of total Cuban sugar exports (Table 5). The 4.5 or 5.0 million metric tons could very well represent maximum figures in the immediate future and are likely to decrease for three reasons. First, Cuba’s Far Eastern markets are threatened by cheaper freight rates for sugar from Thailand and Australia. Second, the North African markets face competition from subsidized European exports of refined sugar (La Sociedad Económica, 1992a, p. 2). Finally, the current economic changes in the CIS countries will decrease the demand for Cuban sugar in the future. For example, Russia’s decision to cancel the final phase of their 1992 sugar trade agreement with Cuba, which has reduced the CIS figure by 500,000 tons in 1992, was based on oil shortages and sugar purchases from the European Community. Future relations between Cuba and the United States will have a significant influence on Cuba’s sugar industry and sugar exports. There are two possible scenarios: U.S. trade with Castro’s Cuba and with a post Castro Cuba. Based on the numerous statements made by President Bush against Castro and his regime, the first scenario would seem unlikely (although not impossible) to occur under the current Administration. Smith and Morales (1988), however, have outlined major areas of disagreement between their two countries while advocating negotiations rather than continued confrontation. Under the second scenario the United States would recognize a post Castro government in a democratic Cuba and re-establish diplomatic and commercial relations with Cuba. Although the two scenarios would bring about different trade relations between the two countries, there is no doubt that Cuban sugar would be a topic of major importance under both scenarios. The former Cuban sugar quota, although temporarily suspended in 1960, has disappeared as a result of decreasing imports brought about by expanded domestic production in the United States and shifts to less expensive substitutes caloric sweeteners like high fructose corn syrup. The three million tons average that Cuba exported to the United States in 1958 and 1959 represent twice the amount of total U.S. import requirements for 1991-92. 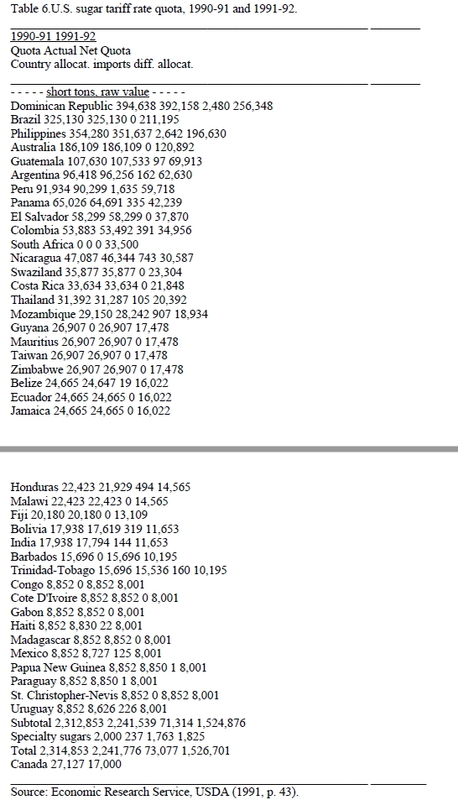 Table 2 shows the reallocation of the Cuban quota in 1962 and 1965. 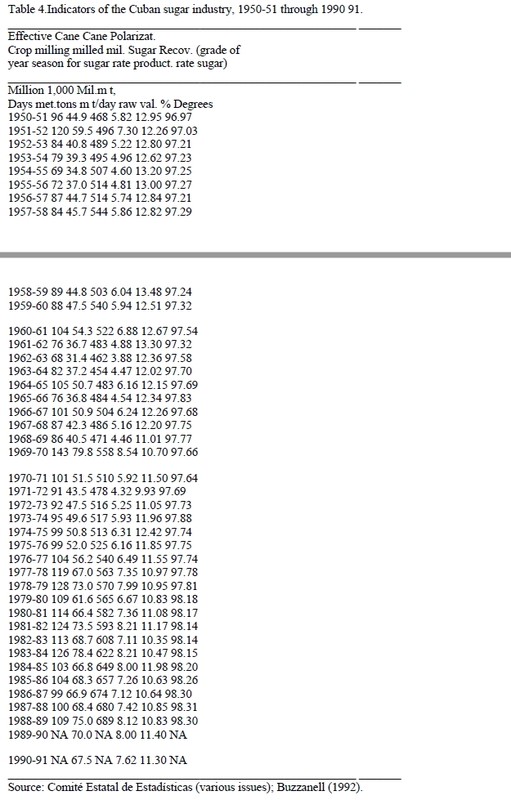 Table 6 contains quota allocations for 1990-91 and 1991-92. The number of quota-holding countries, excluding Cuba, has increased from 21 in 1962 to 29 in 1965, and to 40 in 1991. Relative shares have also changed. However, it is interesting to note that, in previous cases similar to Cuba’s, the U.S. Congress has reinstated sugar quotas withheld for political reasons. That was the case of Nicaragua, after the defeat of the Sandinista Government, and of South Africa as recent as 1991-92. Since sugar exports are the main source of Cuban foreign exchange, it is not unlikely that some type of provision may need to be made by the U.S. Congress for sugar imports from Cuba. Leaving the solution to politicians, let us take a look at the potential amounts of Cuban sugar that could become available for the U.S. and other markets. 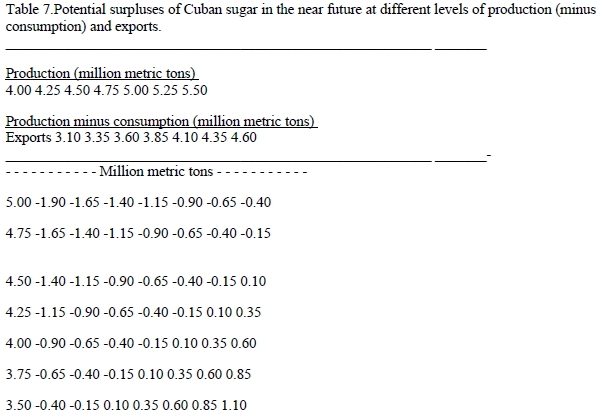 The preceding analyses on Cuba’s producing and exporting capabilities allow the projection of different levels of surpluses of Cuban sugar in the immediate future and the remainder of the decade (Table 7). As discussed above, current forecasts for the 1991-92 harvest fall between 5.0 and 5.5 million metric tons with the possibility of lower outputs in the current and following years. For that reason, potential production ranges from a low 4.0 to a high 5.5 million metric tons. After deducting 900,000 tons for direct consumption and industrial use (allowing for a minor increase from the 810,000 tons average of the 1985-89 period computed from data shown in Pérez-López (1991a, p. 27)), potential amounts available for exporting range from 3.1 to 4.6 million metric tons. Finally, 1992 export projections amount to 4.5 or 5.0 million tons with potential decreases after 1992. The third row in Table 7 highlights the likely outcomes from different production levels in 1992 with exports assumed at 4.5 million tons. The figures do not take into account changes in stocks or increases in production and decreases in consumption in the importing countries. If the most optimistic production figure of 5.5 million metric tons is achieved, Cuba will have a surplus of about 100,000 metric tons of sugar in 1992. In the following years, assuming additional losses in export markets and unless the crop reaches catastrophic proportions, higher surpluses are plausible. For example, Timm (1992) reported in late July 1992 that traditional buyers of Cuban sugar, from Japan to CIS countries, are turning to Thailand to solve their sugar needs. Uncertainty about future Cuban supplies are also forcing South Korea, Malaysia, and Iran to consider purchasing Thai sugar. These trade agreements will inflict severe damage to Cuba’s future exporting capabilities. There seem to be three courses of action for the Cuban government. First, Cuba could take away markets from other exporters by exercising the option of selling at a discount from world prices; but, as a sugar analyst has stated, “one difficulty is that in competing for significant Asian outlets against more closely located suppliers, Cuba operates under the disadvantage of higher transportation costs” (Hagelberg, 1992, p. 2). The second alternative would come about as the result of a successful agreement in the Uruguay Round of negotiations under GATT. This scenario, under which Cuban sugar would compete in a free world market, however, would take several years to materialize. The last alternative is access to the U.S. market. As discussed in the previous publication (Alvarez, 1992a; 1992b), and recognizing that some type of provision may need to be made by the U.S. Congress for sugar imports from a democratic Cuba, there is no reason to believe that the U.S. market can absorb Cuban sugar surpluses of around 1 million metric tons. Alfonso, Pablo. “Lluvias Afectan Viviendas y Cosechas,” El Nuevo Herald, Miami, Florida, June 25, 1992, p. 3A. Alonso, Jose F. and Peter J. Buzzanell. “Cuba’s Sugar Economy: Recent Performance and Challenges for the 1990s,” in Scott B. MacDonald and Georges A. Fauriol (Eds.) The Politics of the Caribbean Basin Sugar Trade. New York, NY: Praeger, 1991, pp. 41-68. Alvarez, Fernando and Jose Alvarez. “Commodity-Linked Transactions and Recapitalization Needs for Privatizing the Economy in a Democratic Cuba: The Case of Sugar,” in Cuba in Transition Papers and Proceedings of the First Annual Meeting of the Asociation for the Study of the Cuban Economy (ASCE), Florida International University, Miami, FL, August 15-17, 1991, pp. 143-184. Alvarez, Jose. “A Chronology of Three Decades of Centralised Economic Planning in Cuba,” Communist Economies 2:1 (1990), pp. 101-125. Alvarez, Jose. Cuba’s Sugar Industry in the 1990s: Potential Exports to the U.S. and World Markets, International Working Paper IW92-2, Food and Resource Economics Department, University of Florida, Gainesville, Florida, February 1992a. Alvarez, Jose. Cuba’s Sugar Industry in the 1990s: Potential Exports to the U.S. and World Markets, (Addendum to International Working Paper IW92 2), Food and Resource Economics Department, University of Florida, Gainesville, Florida, April 24, 1992b. Alvarez, Jose. Politics vs. Economics in International Trade: The Case of Cuba U.S. Sugar Relations. Staff Paper 73, Food and Resource Economics Department, Institute of Food and Agricultural Sciences, University of Florida, Gainesville, FL, February 1978, 14 pp. Bates, Thomas H. “The Long-Run Efficiency of United States Sugar Policy,” Journal of Farm Economics 50 (1968), pp. 521-535. Bussey, Jane. “Mexico forging business-front ties with Cuba,” The Miami Herald, October 13, 1991, pp. 1K, 3K. Buzzanell, Peter J. “An Overview of Mexican Sugar,” Sugar y Azucar 86:12 (December 1991), pp. 2734. Buzzanell, Peter J. “Cuba’s Sugar Industry Facing a New World Order,” Sugar and Sweetener Situation and Outlook Report, SSRV17N1, Economic Research Service, U.S. Department of Agriculture, Washington, DC, March 1992, pp. 24-41. U.S. Department of Agriculture, Washington, DC, June 1989, pp. 17-28. Comité Estatal de Estadísticas, Anuario Estadístico de Cuba. La Habana: Editorial Estadística, various issues. Cuban Economic Research Project. Cuba: Agriculture and Planning, 1963 1964. Coral Gables, FL: University of Miami, 1965. David, Eduardo. “Sugar Production in Cuba,” Sugar y Azucar 78:2 (1983), pp. 100-108. U.S. Department of Agriculture, September 30, 1991. Economic Research Service. Sugar and Sweetener Situation and Outlook Report. Washington, DC: U.S. Department of Agriculture, December 1991. El Nuevo Herald, Miami, Florida, November 26, 1991, p. 3A. El Nuevo Herald, Miami, Florida, January 13, 1992, p. 4A. El Nuevo Herald, Miami, Florida, May 8, 1992, pp. 1A, 4A. El Nuevo Herald, Miami, Florida, May 9, 1992, p. 3A. Feuer, Carl Henry. “The Performance of the Cuban Sugar Industry, 1981 85,” in A. Zimbalist (Ed.) Cuba’s Socialist Economy Toward the 1990s. Boulder, CO: Lynne Rienner Publishers, Inc. 1987, pp. 6983. Fundación Sociedad Económica de Amigos del País. “Cuba & Sugar: Looking to the Future,” Bulletin 13, Report on the Seminar Sponsored by La Sociedad Económica, Dominican Republic, February 4-6, 1992a. Fundación Sociedad Económica de Amigos del País. “Further Downward Adjustment of Cuba’s 1991/92 Sugar Crop,” (Press Release), London, UK, April 20, 1992b. Gluck, Ken. “Cuba Recibe Ultima Gota de Crudo Ruso, Informan en Moscú,” El Nuevo Herald, Miami, Florida, July 20, 1992, p. 1A. Hagelberg, G.B. “Bleak Crop & Export Prospects,” Cuba Business, London, UK, February 1992, p. 2. I International Sugar Organization. Yearbook. London: International Sugar Organization, 1988. Licht, F.O. “The Changing Sugar Pattern in East Europe,” International Sugar and Sweetener Report 123:20 (June 1991), pp. 323-328. Licht, F.O. “The Market for Cuban Sugar,” International Sugar and Sweetener Report 123:21 (July 1991), pp. 339-342. Pérez-López, Jorge F. “Sugar and Structural Change in the Cuban Economy,” World Development 17:10 (1989), pp. 1627-1642. Pérez-López, Jorge F. “Sugar and the Cuban Economy: Implications After Thirty Years,” Journal of International Food & Agribusiness Marketing 3:2 (1991a), pp. 25-46. Pérez-López, Jorge F. The Economics of Cuban Sugar. Pittsburgh, PA: University of Pittsburgh Press, 1991b. Polopolus, Leo C. and Jose Alvarez. “Sugar and the North American Free Trade Agreement: Some Major Issues,” Food and Resource Economics Sugar Policy Series No. 7, Institute of Food and Agricultural Sciences, University of Florida, Gainesville, Florida, July 1992. Rivero, Nicolas. “Privatization of Mexico’s Sugar,” Sugar y Azucar 86:12 (December 1991), pp. 35-40. Rivero, Nicolas. “The Future for Cuban Sugar,” F.O. Licht’s International Sugar and Sweetener Report, Vol. 124, No. 10, March 20, 1992, pp. 157 165. Smith, Wayne S. and Esteban Morales Dominguez. Eds. Subject to Solution: Problems in Cuban-U.S. Relations. Boulder, CO: Lynne Rienner Publishers, 1988. Thomas, Hugh. Cuba, The Pursuit of Freedom. New York, NY: Harper and Row, 1971. Timm, Mark. “Compradores de Azúcar Descartan a Cuba,” El Nuevo Herald, Miami, Florida, July 24, 1992, p. 5B.